Most corporate worship songs have a very catchy sound with memorable lyrics but lack originality. 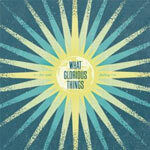 Indie band What Glorious Things is attempting to integrate originality into their sound with their latest release Far and Fading. The band seems to be rooted in post-punk/alternative rock, with a desire to "take back the radio" that sets listeners up for an interesting listening experience. The album opens with the anthemic "Draw Near." It's a clear song calling out for God to take hold of humanity with His great love. The music is rich in depth and quality. "You are Mine Forever" follows with an aggressive message of being redeemed, as lead singer Jason Hansen sings, "Take my hands, take my heart…" The track is assertive but is laced with grace. "Whisper" introduces the softer sound of the band - and it fits very well. It's a song of the mercy and tenderness that God shows the believer. While the song feels like it is constantly on the verge of peaking, it walks a great line of musical tension until it concludes with a beautiful yet simple piano solo. "Shards" brings a more contrastingly rougher sound than its predecessor. The message of redemption continues in this track but with a more introspective approach and a more emotional feeling. The album concludes with the upbeat and hopeful "I Chase You." It's a wonderful way to end the album as it really shows how the believer gains a desire to pursue the Lord after they are redeemed and restored. The music is spectacular and optimistic while not sounding tacky. Overall, What Glorious Things has produced a very good album in Far and Fading. Worship leaders and easy-listening music connoisseurs alike can find something to enjoy on this EP. The production quality is high, the music is rich, and the lyrics are heartfelt and meaningful. If this is the caliber of an indie band just wanting to make a difference, then it sounds like there are some "mainstream" bands that need to step up their level of excellence. Well done, What Glorious Things. Well done.